We worked with the Harrison Chamber of Commerce to create a mobile-friendly and responsive website where information is easier to locate and navigate. We added clear call-to-action buttons and separated the Chamber’s content into distinct areas of LIVE, WORK, and PLAY so that visitors to the area, and to the website, can easily and quickly get to the information they are needing. 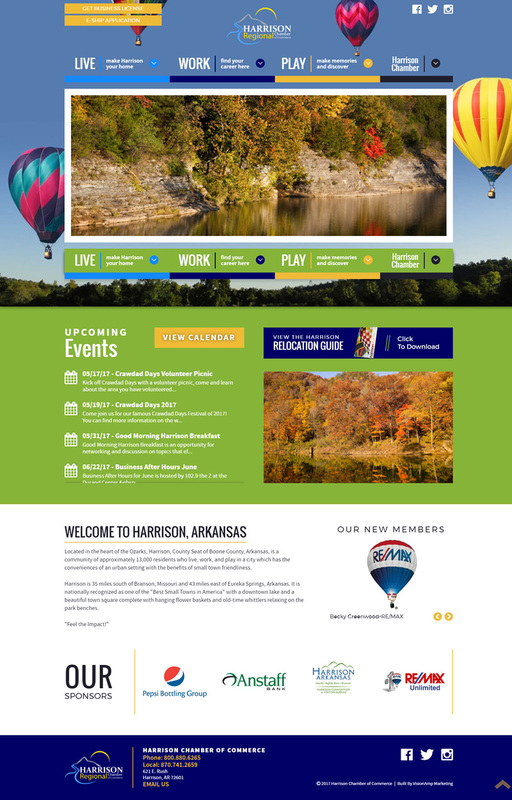 The Harrison Chamber of Commerce is located in Harrison, Arkansas. Harrison is home to approximately 13,000 residents and is continuously growing and expanding. It is also nationally recognized as one of the "Best Small Towns in America"